The second 2 lucky winners of “Caltex Star Drive – Car and Bike Chase” awarded. | Welcome to Chevron Lubricant Lanka PLC. » News » The second 2 lucky winners of “Caltex Star Drive – Car and Bike Chase” awarded. The second 2 lucky winners of “Caltex Star Drive – Car and Bike Chase” awarded. Photo caption : The winners of the second round of “Caltex Star Drive – Car & Bike Chase” with their awards. 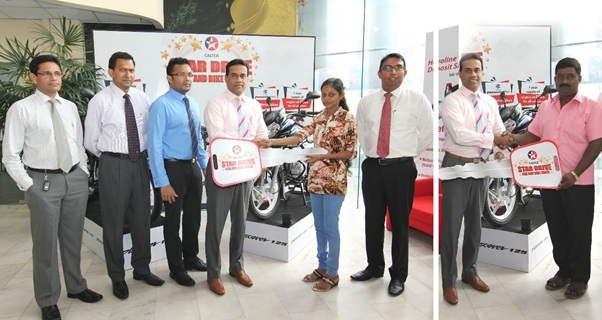 The second two winners of Caltex Star Drive – Car and Bike Chase” received their brand-new Bajaj Discover 125cc motorcycles plus a year’s worth of free engine oil at an event held at the Chevron House in Colombo 3, on the 7th of June 2017. The lucky winners of the second round were Ms. M. L. Geethika Lakmali from Thelijjawila and Mr. Sangaralingham Vanamurali from Chavakachcheri. The first 2 winners received their bikes on the 4th of May 2017, while 2 more randomly selected winners per month will stand the chance of winning a motorcycle each during the months of June and July 2017. The remaining two motorcycles and the Honda BR-V Compact SUV will be awarded at a Grand draw which will be held in September 2017. The closing date for the entries has been extended by 2 months until the 31st of August 2017due to popular demand. To stand a chance of winning these valuable prizes, the consumers simply need to reveal the secret code by scratching the panel on the reverse of the card attached to the promotional pack and SMS it to 2343 by typing CALTEX <SPACE> SECRET CODE <SPACE> NIC NUMBER.